Summertime, and the training’s not easy. Nor should it be. As the season typically means a lighter racing schedule for competitive runners, consider it an opportunity to experiment with workouts and take advantage of ample recovery time to push harder than usual. Ladder, pyramid, and alternator workouts inject speed into summer that will yield results all through autumn. The main advantage of descending ladders is mental – as efforts get shorter, it seems the workout is getting easier (which, of course, it isn’t, not if you’re doing it right). Use them to develop your ability to speed up despite mounting fatigue. Run it: Perform efforts of 1600 metres, 1200 metres, 800 metres, 400 metres, with a three-minute recovery between each. The goal is to run them fast, increasing your speed by a second or two per lap with each interval, without blowing up. 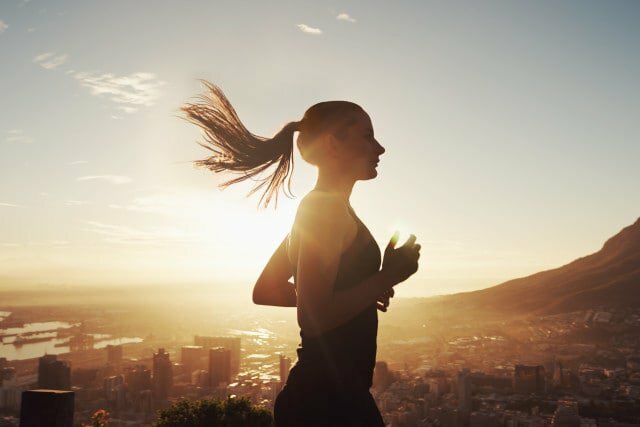 Run as a benchmark session once every four weeks when preparing for a 5K. These sessions help ingrain race pace with repeats that get progressively longer, and therefore harder, mimicking a race scenario. Approach with caution: Running 1600 metres at marathon pace will initially feel easy, and you can end up running 20 to 30 seconds faster than goal pace without realising it. This is an early pacing mistake that can come back to haunt you – in the workout, and on race day. Run it: Do the following workout: Run 1600 metres, jog 800 metres, run 3200 metres, jog 800 metres, 4800 metres, jog 1600 metres, run 6400 metres. Maintain marathon pace on each effort. Repeat monthly as a marathon-pace workout, running up to five kilometres initially, until you can handle the whole workout. Combining ascending and descending efforts improves your ability to shift gears between different paces and handle surges during races. The range of paces helps you transition from slower base training to race-pace work starting about three months before your next goal race. Run it: Elite coach Brad Hudson prescribes fartleks of 1:00, 2:00, 3:00, 2:00, 1:00. In between, recover by jogging the same duration as the effort you just completed. Run the 1:00 intervals close to 1600-metre pace, the 2:00 intervals at 5K pace, and the 3:00 intervals at 10K pace. Progress by extending the pyramid to 1-2-3-2-1-2-3 or 1-2-3-2-1-2-3-2-1. Everyone has a gut-busting workout that gives them confidence in their fitness. Mine was alternating 800- and 300-metre repeats, prescribed by my coach, Matt Centrowitz, for 5K training. I found that the quicker tempo of the 300s helped me run the longer efforts faster than if I’d been running straight 800s. Run it: Do 800 metres hard, jog 200 metres, run 300 metres hard, jog 300 metres. Repeat four to six times. Start the 800s at 10K pace and the 300s at 5K pace, and get slightly faster with each effort. This workout can be done throughout training: Hit the maximum number of repeats two months before your goal event; do fewer reps at a faster pace as race day approaches. Do 1600/600 repeats for a half- or full marathon. Run 400, 600, 400, 200 metres, at 1600-metre pace or quicker, with 1:30 jog rest. Jog 1200 metres. Run 600, 400, 300, 200, 100 metres, starting at 5K pace and accelerating. Rest 1:00 after the 600 and 400, and 0:30 thereafter.